Eat Square has now rebranded to become Free Range Pies. Free Range Pies will take on all the catering and event business. Any catering bookings will now be carried out by Free Range Pies and the Facebook and social media will also now become Free Range Pies. As the name suggests, the focus of the new brand is around quality ethically sourced ingredients and the best possible pies from free range ingredients. There is a growing trend for hot food-to-go. Eat Square aim to bring quality to this marketplace using locally farmed premium produce and avoiding preservatives and non natural ingredients. Our pies are naturally good and very tasty! When you eat a pie from Eat Square you can be sure of great flavour. The pastry is Alex's granny's own recipe. The fillings are traditional and tasty. And the ingredients are from farms and sources we know and trust – such as our friend Adam, who rears Gloucester Old Spot pigs in the local village of Box. The attached slide shows us at the Tidy Studios in Cardiff. We spent several hours discussing the business, brand and products. Pies were consumed by all. The Tidy Studios team will be creating new brand messaging, imagery &, most importantly, packaging. Packaging is at the core of taking Eat Square on to the shelves of major supermarkets. Talks are on going with Morrisons South West. Once the packaging is finished, we should start to supply around 50 stores. This will then lead us on to a national roll-out. The brand update & new packaging will also help us get in to other stores. Our prime targets will be Ocado and Sainsburys. 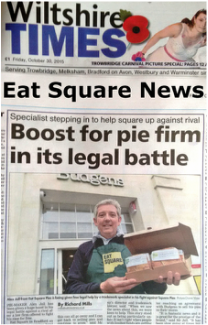 As you will have read on Seedrs, Eat Square has established itself as an award-winning local artisan pie producer. With this round of crowdfunding we will take our pies to a much wider audience & scale the business rapidly. Eat Square is a recently started (2014) rural venture making carefully crafted pies and pastries using the best local ingredients. We currently sell at markets and in a number of shops, pubs and restaurants across Wiltshire. We have tested our recipes and pies extensively and are always trying to make them even better. The pastry of a pie is crucial. We didn’t want to go down the fluff-and-nonsense mass-produced road so we stuck to granny's own short-crust pastry. It's rich, it’s nicely flaky – and people love it! We source our meat locally and know some of the farmers personally. This is really important to us as we feel this sets us apart from the big pie companies (and makes our pies taste a whole lot better). We add new types of pie on a regular basis. February 2015 we successfully ran a crowd funding event and raised over £2,500. You can see details of this below. This money helped us buy a pie press and move in to new premises. With our new kitchen at Woolley Grange Farm, just outside Bradford-on-Avon in Wiltshire, we are able to make many thousands of pies all by hand and supply a growing area. This now includes online ordering as well as a growing number of outlets selling our pies hot and ready to eat. We are a Wiltshire company and try to get all of our key ingredients from Wiltshire, and preferably within just a few miles. We use a local farm butcher, Church Farm in Broughton Gifford, for our meats. The beef is their own and the pork comes from just down the road in Box. Eat Square also likes to get involved in the local community. You will see us at local events, clubs and fairs. Follow us on Facebook to keep up to date with where we are and what we are doing. The proof is in the eating and taste and flavour are what discerning people want. Once you try Eat Square we want you to ask for it everywhere and order it online. If you haven’t tried a pie by Eat Square yet then just click here to order online. If you know a pub, restaurant or cafe where you would like to Eat Square just drop us a line through the contact page. You can also send us ideas for more foods that you would like to see square. Eat Square is proud to have the highest possible food hygiene rating for our kitchen - for the 4th year running. We believe in Passion as the driving force to succeed in all our endeavors. Eat Square is running a new crowdfunding program in 2017. This is through Seedrs and will enable people to buy a piece of Eat Square Limited. For more information see the crowdfunding page here.